It is a place where I come to nurture my soul, work with my hands and allow my imagination to soar. I am so thankful and blessed to have my little creative space in my house. Being downstairs with no windows it is a warm and cozy environment. 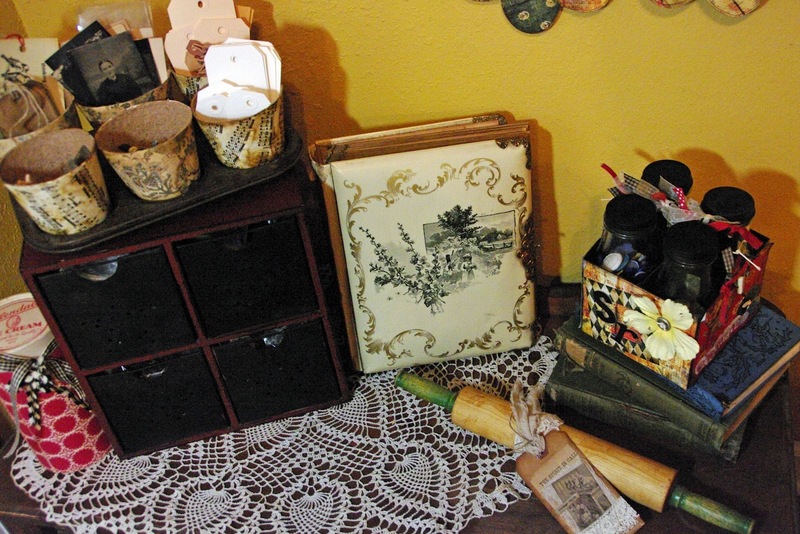 I love surrounding my space with vintage finds just waiting to be used in my artwork. 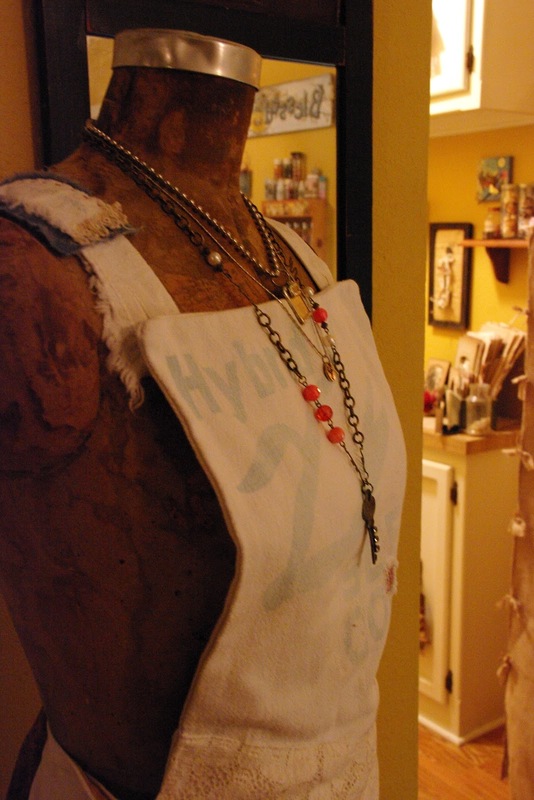 Miss Clara M, my vintage mannequin, is one of my most treasured pieces in my studio. 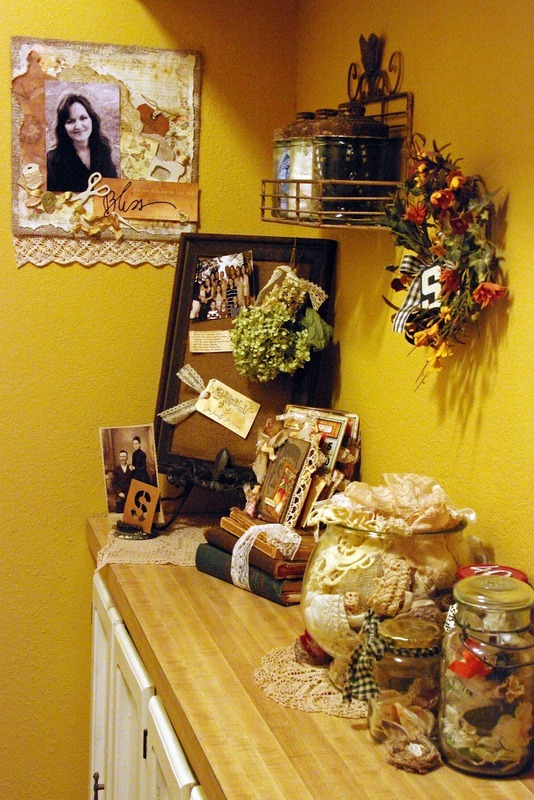 Family pictures and along with family heirlooms are displayed along side creative embellishments. Cabinets hold more creative finds and fabrics. My Grandma's jewelry box holds small treasures just waiting to be used. Being surrounded by creative displays and organized storage, inspires me to create. 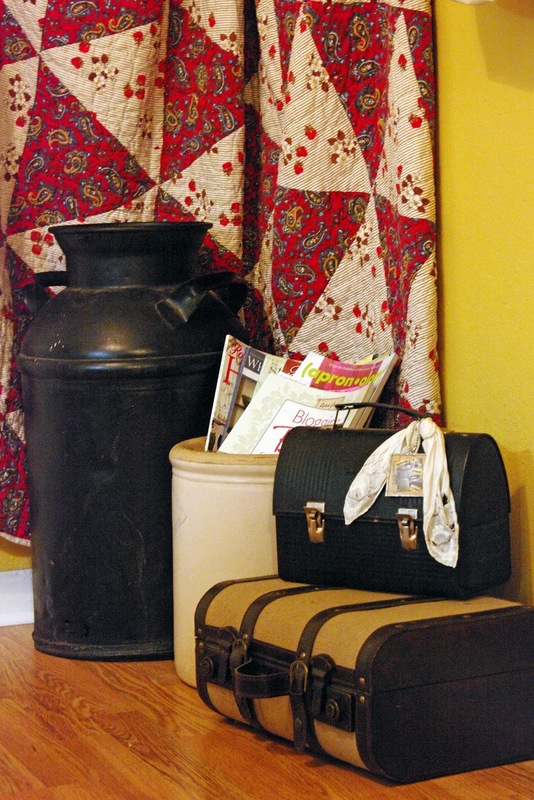 Suitcases and lunchboxes, along with old crocks hold creative magazines, books and crafting goodies. I use vintage drawers hung on the wall to hold more artwork and vintage finds. Thank you for visiting me and my creative space. 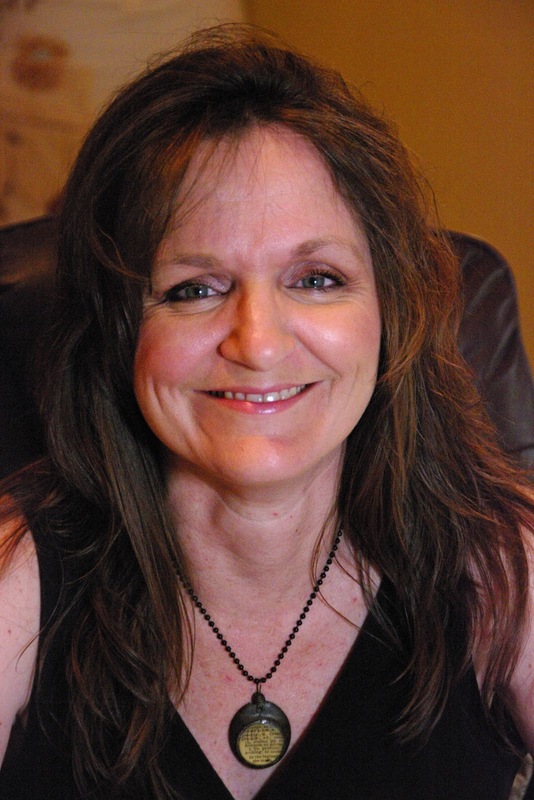 Thank you Karen for hosting this wonderful blogging party! As a special thank you for visiting, I would like to give one of my readers a chance to win this handcrafted soldered piece "Let's be friends again." Please leave a comment to be in the drawing for this giveaway. I will be drawing the name of the lucky winner on Saturday, July 21st at 6 pm. Now I am off to visit all the other bloggers creative spaces. Your space is so cozy and inviting, it is easy to see how you would love spending time there. Thank you for sharing! Mmm, you are right, it is such a comfy space! 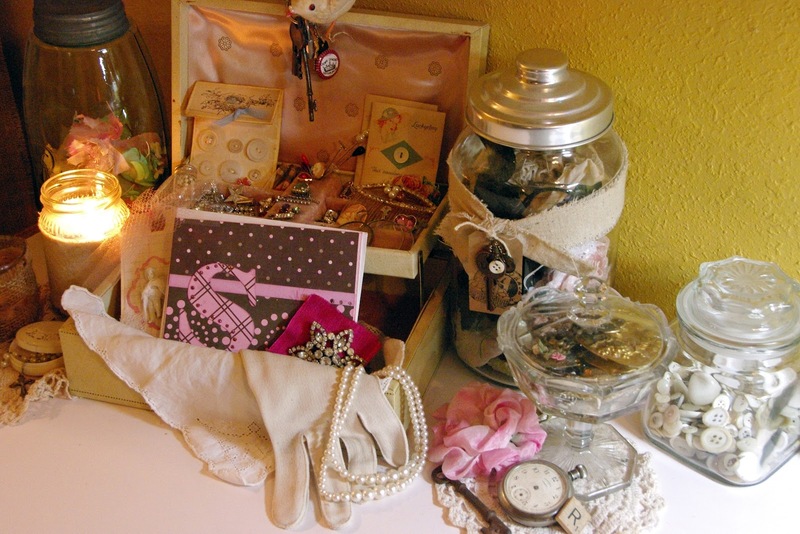 Your space is lovely and I adore all the vintage bits! How charming! What a wonderful space to create. . . Thank you for sharing this wonderful space. I love all the vintage. I'll be back often. What a wonderful place to create! 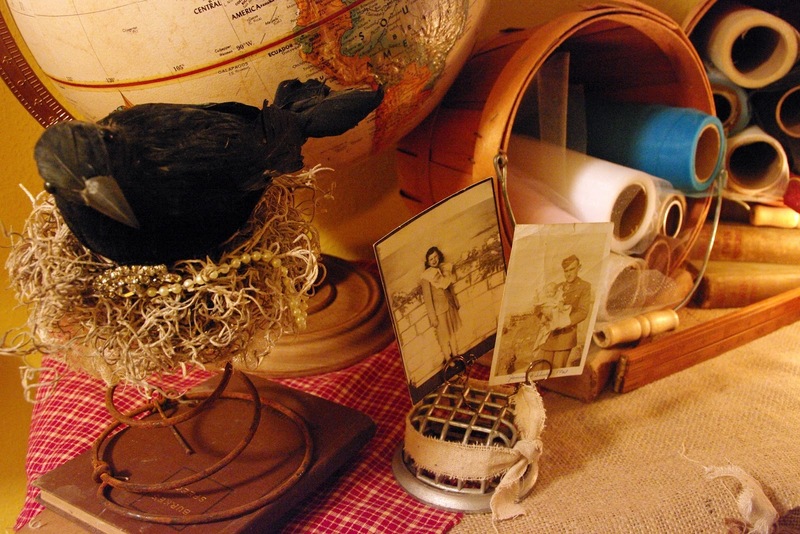 Love your creative space, specially all of your vintage goodies. I do follow your blog on a regular basis. You have a beautiful space and it does look cozy! I especially love how you have so many treasures out where you can see them and be inspired. Thanks for sharing! Hi Sheila! It does look warm and cozy down there!! It's wonderful and filled with so many things that something to you. Thank you for sharing it with all of us. It was great to see your pretty smiling face too!!!! I love your space and all of your vintage finds. Sheila your space is gorgeous! 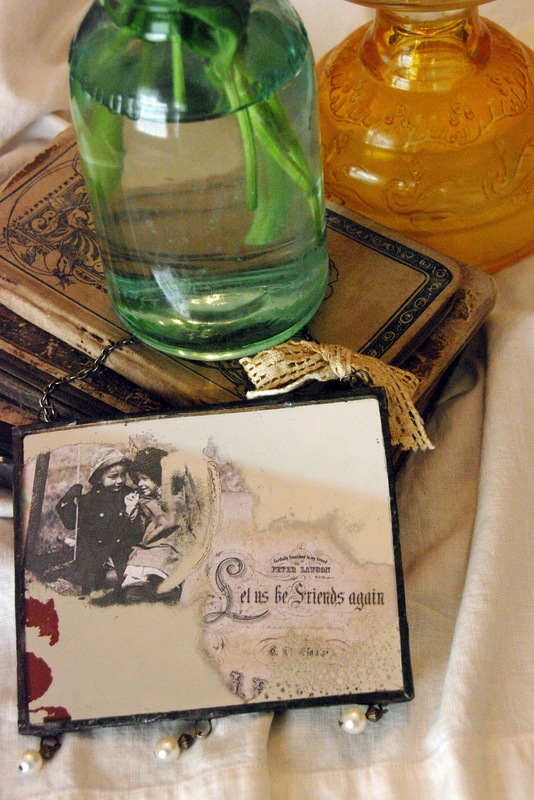 I love how you added sentimental treasures. So inspiring! Great space, Sheila! It must be a pleasure to look around and look at some of the lovely things you have out. Plus, I'm sure they give you inspiration for current projects. It does look very warm and cozy. Thanks for sharing your tour! It looks like a space to really feel cozy and lose your self for hours! I love visiting your creative space time & time again:) It's beautiful, inspiring & so full of eye candy!! Sheila your creative space is just delightful. I love all of your little cubbie spaces. Love all your treasures displayed in your creative space. A beautiful place to create. Your space reminds me of my space. I love looking at all these studios. Your is really cool and so antique.I am a new follower and I am not sure what happened to my profile picture. 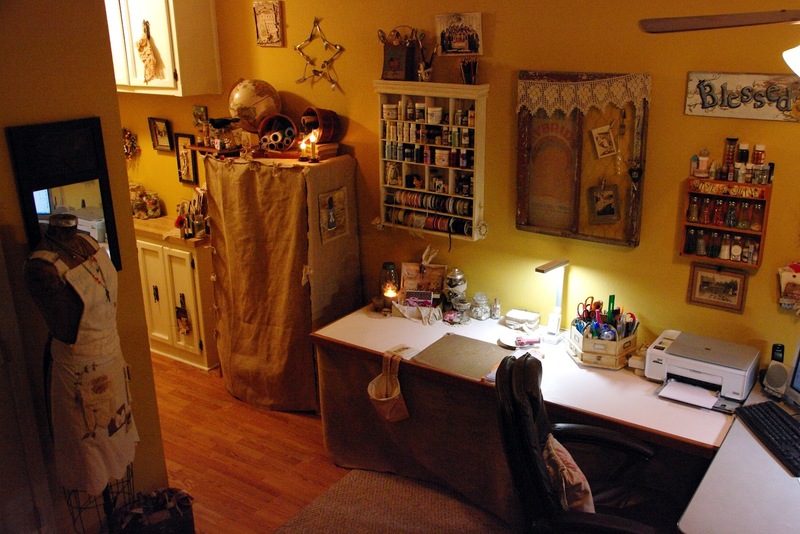 Beautiful workspace! Thank you for sharing. 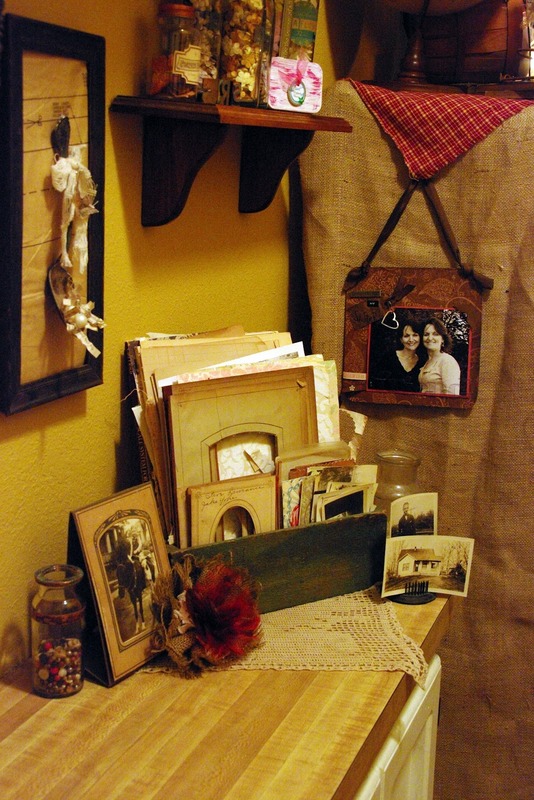 I love that you have your grandmother's jewelry box and love those drawers hung on the wall - what a great idea. Fun hopping with everyone! Your space is beautiful and definitely warm and cozy.... Thank you so much for sharing it with us and can't wait to see more of your artwork! What a cozy spot to retreat to create in. Love all the personal touches and wonderful supplies, thank you for sharing. Your space is wonderful! It looks so warm and cozy.Miss Clara is awesome! I love they way you have displayed all of your treasures! I always love peeking into your studio. Love the distressed, cozy feel of it. I admire your work too. TFS! Just lovely colors and a peaceful setting for creating. You have great studio Thank you for sharing all of your ideas. I love all the vignettes and the colors make the room so cozy-indeed! What a truly lovely space. i especially enjoyed seeing that you have your grandmother's jewelry box put to good use. Isn't it nice to be surrounded by things we love that remind us of people that we love? Thanks for sharing your beautiful space with us. Love your space- you are right it looks so cozy. Love the old photos- such history and stories dying to be told in them! Love the tone of the walls and the whole feeling of your lovely studio. You have very nice storage spaces, my favourite is the solid wod counter tops and how you display your things on them. The size of a creative space does not matter. The most important thing is to have a place, even a corner where we feel happy to sit here, creating according our soul. Have a creative summer. Blessings and Bonjour de france ! 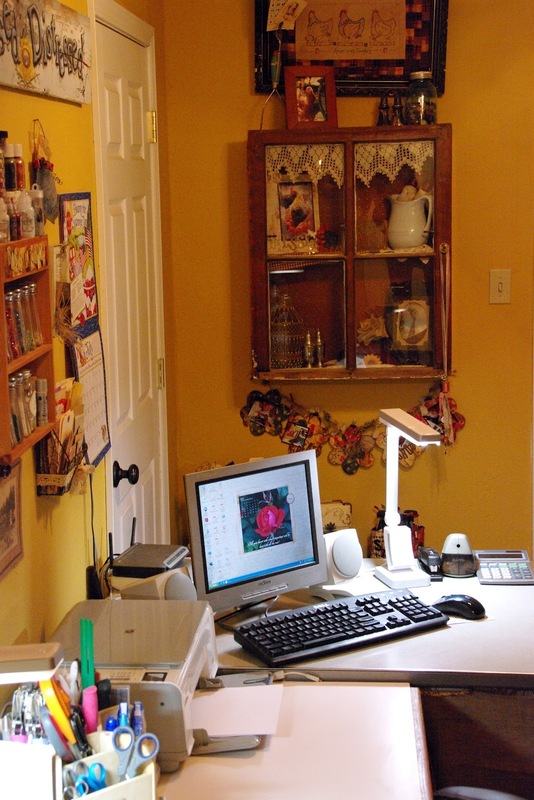 I love your cozy and creative space, and I so enjoyed looking at all your treasures - how inspiring! i love it sheila. you have a great space and some amazing treasures in it. Sheila, you have just my type of studio... So rich in color, cozy with awesome vignettes of wonderful antiques! And hanging the antique wooden drawer on the wall? Brilliant! I just may steal... ER, "borrow" that idea! Thank you for the tour and inspiration! Your space looks like a wonderful cozy place. I love all the vintage goodies you have on display. I would certainly be inspired in a room so lovely! 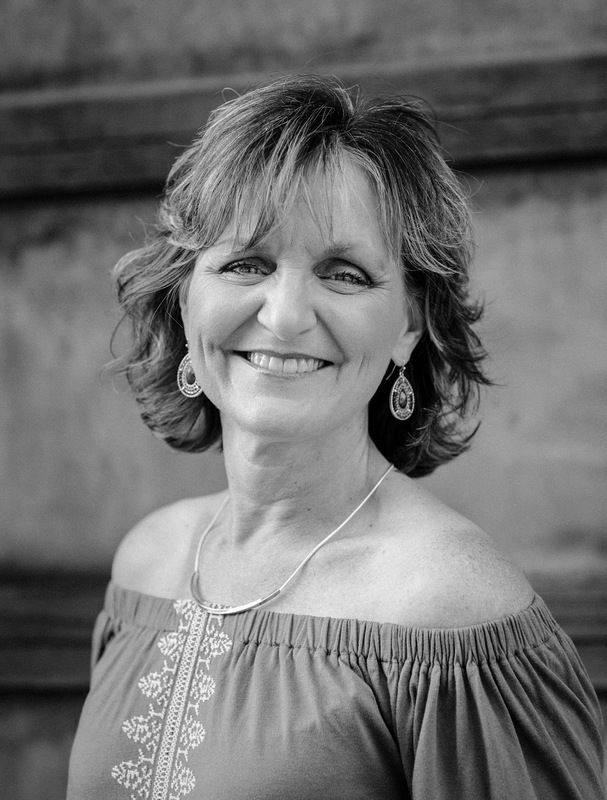 Your studio is AMAZING Sheila! No wonder you create such beauty, with a space like this! Loved getting a sneak peek at your crafting space, you're in the basement & I'm up in the attic. I love your crafting space. 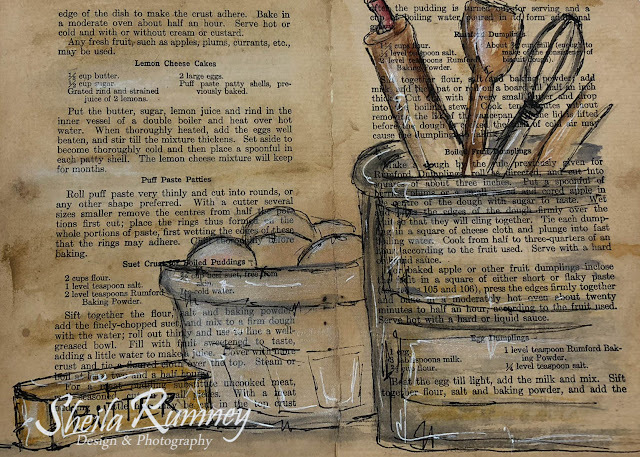 Every nook & cranny is full of inspiration. Thanks so much for sharing. I love your creative space! Your space have so many little treasures that are adorable to look at and an inspiration in themselves. 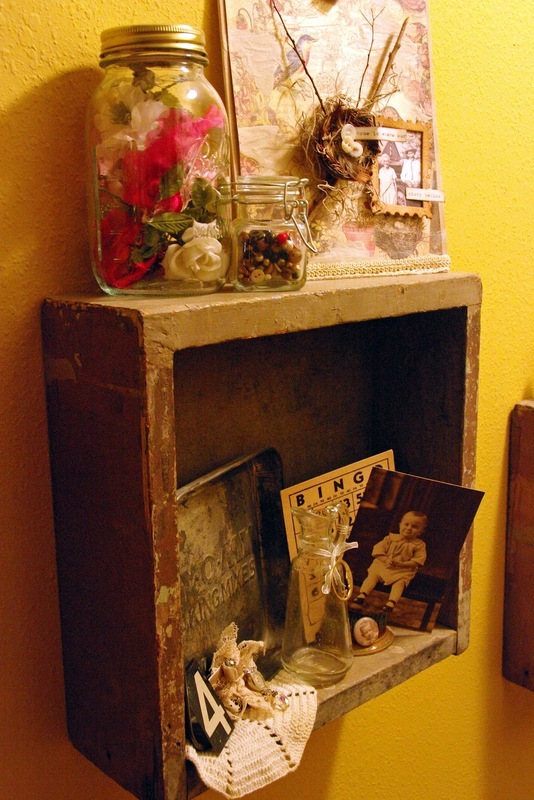 Love the way you have used vintage for the displays, Gorgeous!